Warrington is a rugby league town and the home of the successful side known as the Warrington Wolves. But, if you are worried about the wild world of the used car market and about unscrupulous dealers preying on your good nature by underpaying for your car then it would be the perfect time to turn to a professional car buying service, like WeWantAnyCar.com. 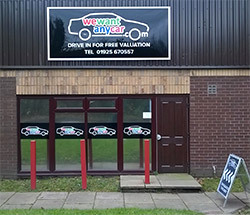 Get your teeth into selling a car in Warrington by getting down to your local WeWantAnyCar.com branch situated in Regus Warrington just a short breakaway from the scrum of the M62 and A574. No one is more geared up to tackling your car buying process with more vigour than WeWantAnyCar.com. We do exactly what we say and will buy any car even if it has been written off, is past its best or still under a finance agreement. Our team will do all the legwork for you from handling the paperwork, offering full consultation and flexible appointments to fit around your busy schedule. To kick start your car sale with WeWantAnyCar.com you can contact Phil on 01925 670557 or on email at warrington@wewantanycar.com. Had a really good experience selling my car to wewantanycar.com, got a good deal and the process was very straightforward. Quick, fair and easy, would definately sell to them again. Cannot fault them - the service was great and the price paid was good as well as prompt. Really pleased I chose we want any car. Much better price than the similar named competitor. Really quick and friendly service. I was really happy with the price they gave me compared to other places I'd been. Very happy customer!